Food labels don’t always give you the whole story? There are more than 10,000 chemical solvents, emulsifiers and preservatives used in our processed foods and over 3000 chemicals are added to our food supply? That MSG has been scientifically proven to cause obesity and is hidden under other names in our foods? The EPA estimates that 4.3 billion tons of toxic pollution is legally dumped into the U.S. environment every year? That under your sink and on your counters are chemicals that kill? There is over 100,000 chemicals registered in the U.S. and less than 10% has been tested for toxicity. This includes chemicals used in our food, household cleaners, personal care products and over 2 billion pounds of pesticides we are exposed to every year? The beauty and cosmetics industry is a self-regulated industry? There is no pre-market testing required on these products. In 1991 the FDA tested cosmetics and found that 95% (of the products tested) contained cancer causing properties? Parabens, one of the most used preservatives in cosmetics have been found intact in breast tumors? Most every person in the U.S. is aware of air pollution. Most people are aware of water pollution and industrial waste being dumped into our environment but how many people know that many of our foods have chemicals in and on them that contribute to cancer, diabetes, obesity and neurological problems. How many people are aware that indoor air pollution in our homes and offices is more toxic than outside air because of the cleaning products, air fresheners and items such as carpets we bring into our homes and businesses. Most people are shocked to find that there is no pre-market testing required for our personal care products such as lotions, cleansers, makeup and shampoos and that many contain cancer causing chemicals or hormone disrupters known to cause birth defects. Scientists have now determined that 85% to 95% of cancer can be attributed to environmental toxicity exposure. That means that most cancers can be prevented by reducing toxic exposure. Cancer rates are reaching 40% and gaining. Lung cancer is now the number one killer of women even as smoking in females has decreased. Of the 2.5 million arthritis patients in the U.S. females out number males 3 to 1 and over 90% of lupus sufferers are female. Over 30% of Americans are obese, over one million people per year are diagnosed with diabetes and Alzheimer’s is reaching pandemic proportions. Our teenagers are taking more prescription drugs for depression than ever before and childhood cancers continually rise. How do we overcome this toxic overload? Awareness. This is the first step to taking control of your health and limiting exposure to harmful ingredients. Reading labels, shopping differently and making better choices is the key. The rest of this article is an overview of three different booklets written to arm you with information and resources to overcome this barrage of toxicity. Preservatives such as BHT, BHA (causes liver and kidney damage, behavioral problems, birth defects and a possible carcinogen), artificial flavorings and food colors (possible carcinogens, toxic chemicals and colors may be derived from coal tar). High fructose corn syrup because it converts to fat, is not metabolized and depletes chromium, which is essential to insulin regulation. Eliminate monosodium glutamate better known as MSG because it is a neurotoxin (it kills brain cells), has been scientifically proven to cause obesity and creates hyperinsulinemia which is directly linked to diabetes. Trans fats because they clog arteries and increase bad cholesterol levels. Simply stop consuming artificial sweeteners. Aspartame is also a neurotoxin, it triggers the elevation of free radicals in the lining of arteries, has been linked to Alzheimer’s and causes cravings for carbohydrates. The FDA warns of possible neurotoxic effects on pregnant women and children. 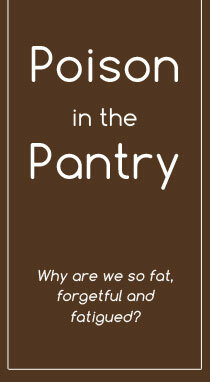 For further information read “Poison in the Pantry: The Truth Behind The Label”. In personal care products the chemical load is astonishing. Look for parabens: methylparaben, polyparaben, propylparaben, etc. These are used as preservatives and are considered relatively safe, however, recent studies have shown these chemical to be hormone disruptors and intact parabens have been found in breast tumors. Parabens cause an overgrowth of breast cells. Parabens are used in blushes, lipsticks, foundation, eye shadow, etc. Pthalates are also hormone disrupters and have been linked to birth defects, are lethal in low doses in lab animals. Dibutyl pthalate in nail polish increases breast cancer risk and causes damage to liver and kidneys and has been linked to fertility problems. Pthalates are used in antiperspirants, lotions, shampoos, moisturizers, hair spray, etc. Sodium Lauryl Sulfate (SLS) is a mutagen that damages the DNA ,is used in most shampoos and many other products. It becomes carcinogenic when mixed with other chemicals. SLS causes liver and kidney damage and actually dries the skin by breaking down the cellular barrier. Fragrances and perfumes are the least regulated of cosmetics, most are synthetic and toxic. A study in 1989 found that of 2983 chemicals used in the fragrance industry 884 are toxic. For more complete information and listings of dangerous chemicals read “Poison in the Pantry: The Beast Behind the Beauty”. Soon to be released. In our homes the chemical exposure comes from many different and surprising sources. VOCs (volatile organic compounds) are airborne chemicals and chemical compounds that are toxic. VOCs come from air fresheners, chlorine and formaldehyde. Formaldehyde is found in permanent press fabrics such as clothing, bed sheets and draperies, paint, carpets, scented cleaners, plastics and many other sources. Side effects range from mild irritation to cellular mutations. There is no law requiring pre-market testing of even the most highly toxic chemical cleaners. Dioxins are from chlorinated products (bleached paper products) such as paper towels, white coffee filters, bathroom tissue and tampons. Exposure to dioxins has been linked to diabetes, ADD, endometriosis. The most toxic chemical ever produced, TCDD, a dioxin is a known carcinogen and is used in some tampons. Air fresheners have been linked to increased rates of asthma, headaches, depression and ear infections in children. To learn more about what to “clean” out of your home “Poison in the Pantry: Secrets Under The Sink” the third booklet yet to be completed will give you guidelines for eliminating toxins from your personal environment. As a consumer your dollar speaks loudest. As more and more dollars shift to non-toxic products so do the manufacturers and producers of these products. There is already a major shift in food production and more is coming. There are alternatives to toxic products. It may seem overwhelming to change so much in your daily life but by replacing toxic products with healthy ones one item at a time it is a simple transition over time and eventually you have “de-toxed” your home and your personal environment. If more and more households and businesses stopped using and contributing to the production of these harmful chemicals imagine the effect it would have on industrial pollution. Change what you can and be aware of the rest. Honor yourself and nature.